The Girl From Ipanema by Stan Getz, Joao Gilberto and Astrud Gilberto is a light, airy song, recorded in 1963. The song was written by two Brazilian composers: Antonio Carlos Jobim, who wrote the music; and Vinicius de Moraes, who wrote the lyrics in Portuguese. Antonio Carlos Jobim, also known as Tom Jobim, was the driving force behind the creation of the Bossa Nova style. The major turning point in his career was bringing his talent and music to the english speaking world with his collaboration with American Jazz saxophonist, Stan Getz, Joao Gilberto and Astrub Gilberto. They created “The Girl From Ipanema” together and after that, the song was recorded by over 200 different artists. The song is about a young Brazilian girl who wore a bikini and walked “like a samba” past a bar the composers went to regularly. 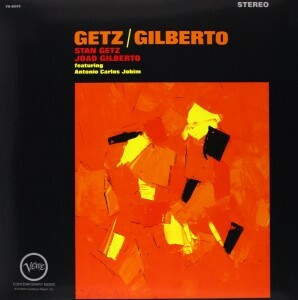 While recording, Stan Getz and Joao Gilberto convinced his wife, Astrud Gilberto to record the english lyrics, which were written by their producer, Norman Gimbel. Out of the three of them, she was the only one who spoke any english. After never recording a single track, she completely blew them away with her simple “child-like” voice which added an airy nuance to the song. Selling over 2 million copies, “The Girl From Ipanema” went on the become the second-most recorded popular song in history. As Getz said, “Music should concern the making of music, not the speculative transcending of its limits…The ear should remain the first and last court of appeal.” When jazz was beginning to become “pompous”. Musical groups were less honest and more focused on innovation than the actual music. When the record Getz/Gilberto was released, poetry and emotion was brought back to Jazz.